With the increasing connectivity of internet among people across the globe, there is need for you to find some video grabbers which will help you retain your favorite videos. For example, you have watched your favorite video on YouTube, then instead of leaving that video offline, you’d love to download it for your later watching and sharing with others. Well, at that time a YouTube grab tool can save you! So today in this article we will tell you the details and descriptions of the top 3 video grabbers online for you to download online videos from YouTube, Vimeo, Dailymotion, TubeChop, etc. So, let’s get started without wasting any time. Tips: Can’t you wait to share it with your friends after watching a video from YouTube? However, usually there is no need for them to watch the whole video to get limited information. Well, you can learn how to share YouTube video at a specific start time or even end time on PC/mobile browser and app to solve this embarrassing problem. If you download videos from YouTube more frequently, then this YouTube grab tool is suitable for you. Its user-friendly interface is so magnificent that anyone can use it very easily and conveniently. Apart from YouTube, it also helps the users to download videos from other platforms like Vimeo, Dailymotion, etc. Simply, you just need to copy that URL and paste it in the option inside this online software. You can choose the video formats according to your needs and requirements. For example, you can download that video in MP4, or maybe in MP3. You can also choose the size of the video to be downloaded according to your data limits and storage space you have. This online software is available for all users for free, so you don’t need to pay any subscription fee for its use! Step 1. Open the video you want to download on YouTube and copy its URL from there. The URL gets copied immediately and then open the Video Grabber. Step 2. After opening its website, paste that URL directly in the space provided. For your convenience we are inserting the picture of that below. Step 3. After pasting that URL there, click on “Download” icon to let the program analyze the video from YouTube. You will be informed to install “Download Launcher”. Click on that icon accordingly and you are all done then. The launcher will be downloaded on your PC automatically followed by downloading of the video. Step 4. It might take some time to analyze the details of the video. After that, you can choose the resolution and the format of the video according to your choice. Then tap “Download” icon to start the online YouTube video downloading. Tips: For your later convenient, you can also choose to download this software onto your PC just by tapping on “Download Desktop Version” option. 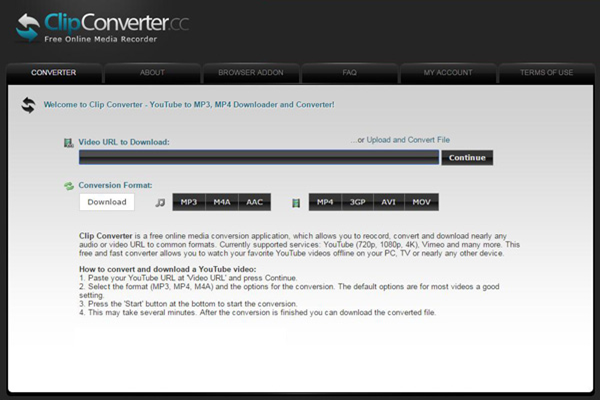 ClipConverter is another video grabber online which makes its users download videos at one go. As compared to Video Grabber, this one has a little edge over it because ClipConverter provides an extra function to convert downloaded videos into MP3 format if you are running out of space. So, this is the plus point of this video grabber which attracts users most. Currently ClipConverter supports YouTube (4K/1080p/720p), Vimeo and many other websites. Step 1. Open YouTube video you want to download and copy its URL. Step 2. Open the ClipConverter and paste that URL in the input box provided. Step 3. Click the “Continue” icon to analyze the video. The details will be fetched shortly. Step 4. After the details are displayed on the screen, choose the resolution and format of the video accordingly and then press “Download”. Note: The whole downloading process will take you longer than Video Grabber does, and the conversion will lose a little bit video quality. 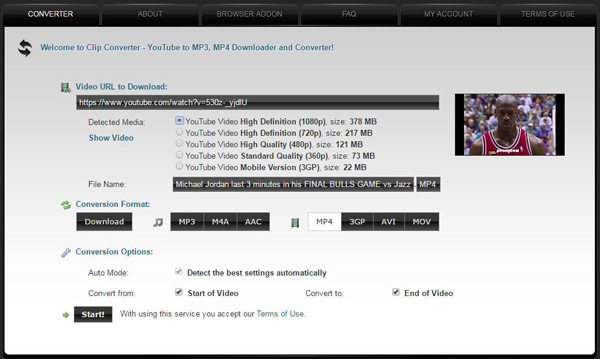 Catchvideo is the last video grabber online used for downloading purpose for free. Meanwhile, you can also download this application directly on your PC when you need to use “Quick Download” option. When it comes to its features and plus points, the interface of Catchvideo is not so attractive compared with Clipconverter or Video Grabber. But with this tool you can download videos much easier by pasting the copied URL. 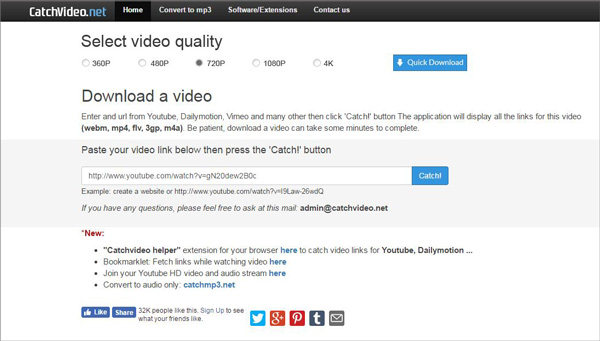 Catchvideo supports downloading videos from almost every platform like YouTube, SoundCloud, Vimeo, Dailymotion, viki.com, Twitter, Metaface and many other video-sharing websites. It provides resolution in 4K/1080p/720p/480p/360p. And you can download the video in MP3 format as well. Step 1. As usual, open the YouTube video and copy its URL. Step 2. Open the video grabber and paste that URL in the input box. Step 3. Select the quality of video according to your needs. Step 4. Click “Catch” to start the downloading. We hope that you have become familiar with the features of these video grabbers online and you can choose the suitable video grabber for yourself! The 3 video grabbers online mentioned above are available for free. If you have any problems, please let us know in the comments section. 5 Best ExtraTorrent Alternatives after ExtraTorrent Shut Down Permanently 2019! How to Easily Download Torrent Files with IDM?